Northern Ireland’s Celtic metallers Darkest Era have revealed the cover artwork and tracklist for their forthcoming album “Severance“, which is due for release on June 3rd 2014 (US) and June 13th (Europe) via Cruz Del Sur. It will be release in both CD and vinyl editions and of course digitally. 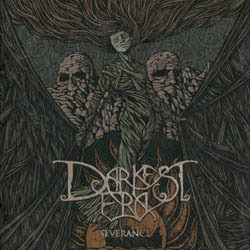 “Severance” was recorded at Data Recording Studios in Ballyheigue, Ireland and produced by Chris Fielding and Darkest Era. The artwork was created by Costin Chioreanu. Guitarist Ade Mulgrew said: “We are really pleased with the artwork which totally captures the atmosphere of this album. Costin has a unique style and immediately got what we were looking for. Severance was recorded during what was a pretty stormy time in the band and against the backdrop of some very atmospheric natural scenery in one of the remotest parts of the west of Ireland. I think all that certainly comes across in the music and we are looking forward to finally unleashing it this summer“.